Cornell was awesome. I really liked the courses, they were top notch. Its definitely worth the fee. The M.Eng courses here tailored to meet industry requirements. We learnt from the top people in the field. I got job offers from Schlumberger and Cisco. I’m taking a position with Schlumberger STIC. The placement here is really good. Oracle and Amazon were big recruiters this year. With job search and 2 semester course the work is pretty intense. The Fall and Spring career fairs are big recruitments and a lot of startups visit during the Spring. Everyone I knew had atleast 2 job offers from big names in the industry. Spring admits have opportunities for internships, however the intake is small. I’ll be happy to share information about the course or Cornell if you ever need. Also, check out this report from Career Resource at Cornell – An M.Eng is well worth your investment of time and money for two important reasons: a higher salary and a more rewarding career. 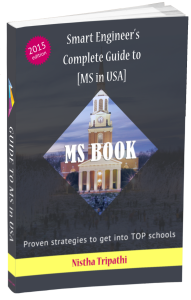 We talk in detail as to how to understand and plan for MS finances in MS Book. Get your copy if you haven’t already.